Image courtesy of Leigh Acton. 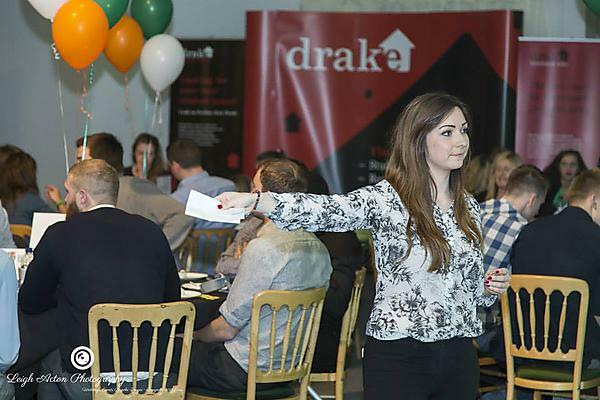 Eight second year event management students as part of their practical module organised the Plymouth Raiders Awards Night in March 2015 attended by 250 players, parents and sponsors. This was the first time this event has been run and celebrates the past year’s successes for all the teams from the children through to the professionals. Following the success of the night it is hoped it will become an annual fixture for the Raiders. The three hour evening event included the presentation of over 25 awards, entertainment, a highlights show, speeches and a meal. "That was undoubtedly the best awards night I’ve been to. We have been to football nights and a tennis night, but this was our first basketball awards night and was blown away - really professional, and very impressed with it all. The food was even good - and that’s a rarity for awards nights! Thank you to everyone concerned." "Just wanted to say last night was amazing. You and the University girls deserve a ton of credit for organising such an awesome night that everyone will remember for a long time." “The event practical has massively benefited me; my communication skills and professionalism have developed through working with clients. The Chief Executive also gave me an impressive reference on LinkedIn, which I hope will improve my chances of work in the future." Ellie explained the roles she carried out prior to and on the night. The team after all the hard work. Image courtesy of Leigh Acton. If you are interested in our events management students getting involved with your event please contact tanya.bellingham@plymouth.ac.uk.